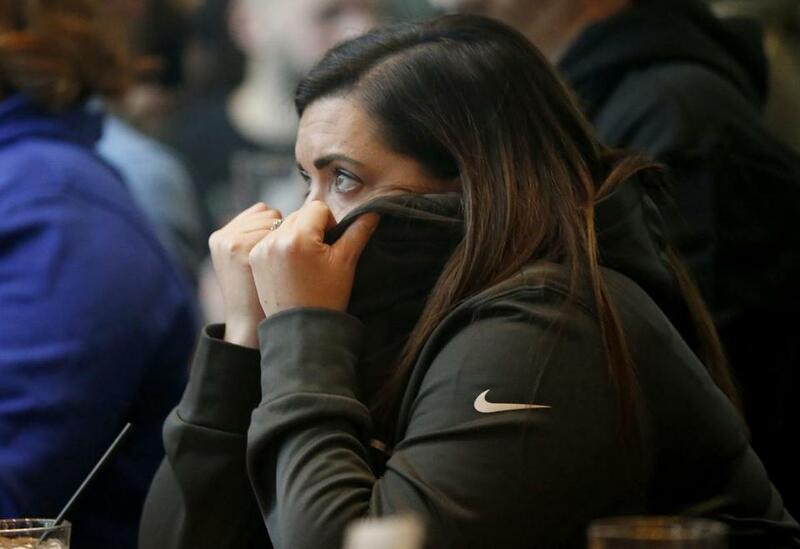 Leslie McCarthy of Medford could barely watch the AFC Championship game. 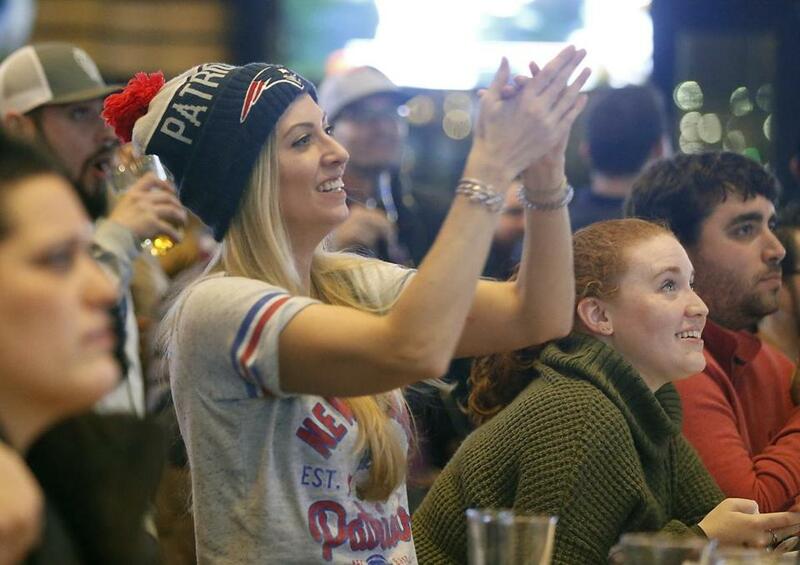 SOMERVILLE — Hundreds of fans who braved icy conditions to cheer on their beloved Patriots Sunday night at Tony C’s, a popular Assembly Row sports bar, fluctuated between anxiety and jubilance during a tense AFC Championship game Sunday night. The capacity crowd of 450 people at Tony C’s exploded with the loudest round of cheering of the night as Tom Brady and the New England Patriots finally defeated the Kansas City Chiefs, 37-31, in overtime around 10:15 p.m. A chant of “Brady! Brady! Brady” drowned out the televisions as fans embraced each other — even strangers, spilling both beer and tears. The Patriots now advance to Super Bowl LIII, where they will play the Los Angeles Rams in Atlanta on Feb. 3. “Now I can breathe until the Super Bowl,” said Kayla Brum, a Tony C’s waitress. 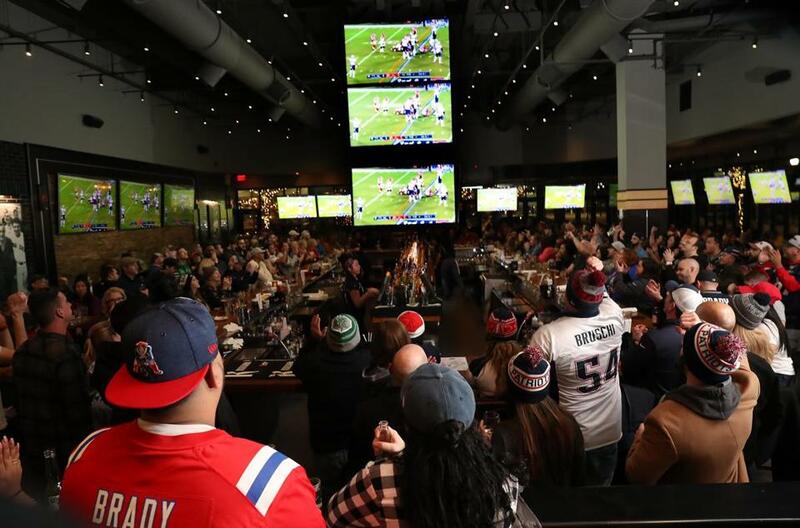 Even early in the night, the treacherous weather wasn’t enough to keep hundreds from gathering at the Somerville haunt to watch the game with fellow Patriots fans. A roar of applause welcomed the game once Melissa Etheridge hit the final note of the national anthem. Even though the Patriots were up by 7-0 — and then 14-0 — in the first half, that didn’t calm everyone’s jitters. Samantha Via cheered on the Patriots at Tony C’s in Somerville. Samantha Via, of Medford, said she had been at the bar since 3:30 p.m. with her friends. Even during the commercials, nerves were running high — “As a Patriots fan, I’m always anxious,” Via said — so the group ordered a round of shots to calm them. “Football and drinking are like peanut butter and jelly,” said one of Via’s friends, Ryan McMurphy. Patriots fans filled Tony C’s in Somerville to watch the Patriots game. But as the score tightened in the second half and the Chiefs eventually pulled ahead, 21-17, a handful of Patriots fans left the bar in a huff, kicking snow outside and punching the air. When the Patriots managed to score another touchdown to bring them up to 24 points in the fourth quarter, the crowd broke into an ear-splitting applause, clinking glasses and throwing their hands into the air. The anxiety from moments ago was lessened, and more rounds of drinks were ordered to get through the last three minutes. But as the quarter dragged on, the uneasiness came back, as the Chiefs answered with a touchdown of their own. “I feel like my whole world is about to crumble,” said Norman Carpentier of Quincy as he nursed a pint of Bud Light. As the Patriots fell behind, he took a larger drink. But then the Patriots came back with a late-quarter touchdown, bringing the score to 31-28 and causing fans to cheer and hug. “This is an emotional roller coaster,” Carpentier screamed. With less than 20 seconds left in regulation, it felt like an earthquake rocked the floor as fans stomped their feet and barstools. Chants of “Let’s Go Patriots” brought the crowd together as they waited for the final plays. “Oh. My. God,” screamed Brum, collapsing dramatically against a bar in the corner as she watched the Chiefs pull the game to a 31-31 tie. “I’m having a borderline heart attack right now,” she said as the game turned to commercial. But when the Patriots handily defeated the Chiefs in the sudden-death overtime, the crowd inside Tony C’s turned downright euphoric. “All I can say now is: Beat L.A. . . . again,” Via said, referencing the oft-used slogan for when the Boston Red Sox took on the Los Angeles Dodgers in the 2018 World Series. For some fans, dragging themselves out of the house — even in the terrible weather, even to watch what was sure to be a stressful game — was still worth it, because of the camaraderie. “It feels like everyone is family,” said Elise Tierney of Somerville. After the game, Brady was asked what he wanted to say to the fans back home. Globe correspondent Alejandro Serrano contributed to this report.